Lots of little things . . .
That eventually add up to some progress in the right direction! It still doesn’t look real great, but as soon as I do something about that early 80s wallpaper, and get my cabinet doors all put back on, I’ll start to like it. 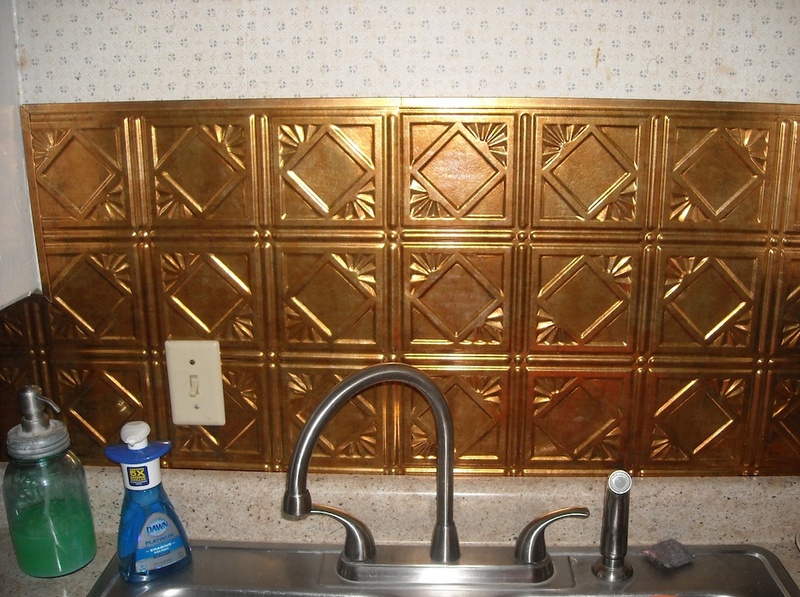 But having the backsplash up is one more step in the right direction. Heck, I’m still quite enamored with the fact that I have a new countertop, sink, and faucet! One thing at a time! Still an eyesore, but progress has been made. 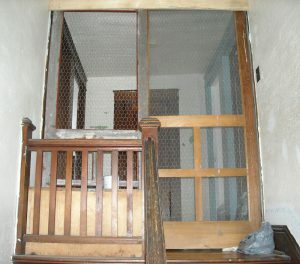 I got these screen doors, had them mounted at the top of the stairs, and then put chicken wire on them for screen. They latch together, so that the cats cannot come into my sewing area. Yes, sort of drastic, but very necessary. This area still needs lots of work. The stairwell walls need to be painted (and the ceiling), the woodwork needs re-done (you can see one side is painted blue — that has to go). The screen doors themselves need to be painted, and well . . . there’s just a lot more that needs doing, but — time! Ugh! But won’t that upper railing look really good with a quilt hanging on it when I’m all done? Rest assured I’ll show you some after pictures (in a few years). Meanwhile . . . sewing . . . I’m getting ready to make something out of this luscious pile of Dear Stella’s Calicos . . . in ALL the colors! Yummy! And I’m getting ready to cut into this pile of goodness. I am such a sucker for polka dots! And red! 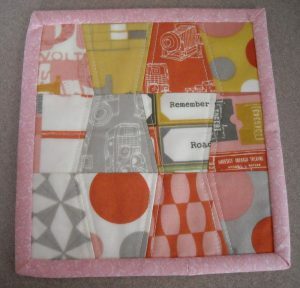 My friend, Doris, sent me this darling little mug rug. I just love happy mail! And My Cowboy did some more online shopping for me. He got me some more of the 12″ graph paper I can’t live without. I don’t design on the computer, and I was down to my last 3 sheets, so I whined, and this magically appeared in the mail a few days later! I’m trying to think of something else I want, so I can “mention it” to him! And lastly, I’m showing you what I’ve decided to do with some of my mementos. Things I want to keep, but not glue into a scrapbook, yet still be able to look at them, and add to. I got some large binder rings, and hole punched the cards and put them on the rings. It’s like a mini notebook all self-contained. I can add to it or subtract from it anytime I want, and it’s fun to flip through for inspiration. If these rings get too full, I’ll just start another one. 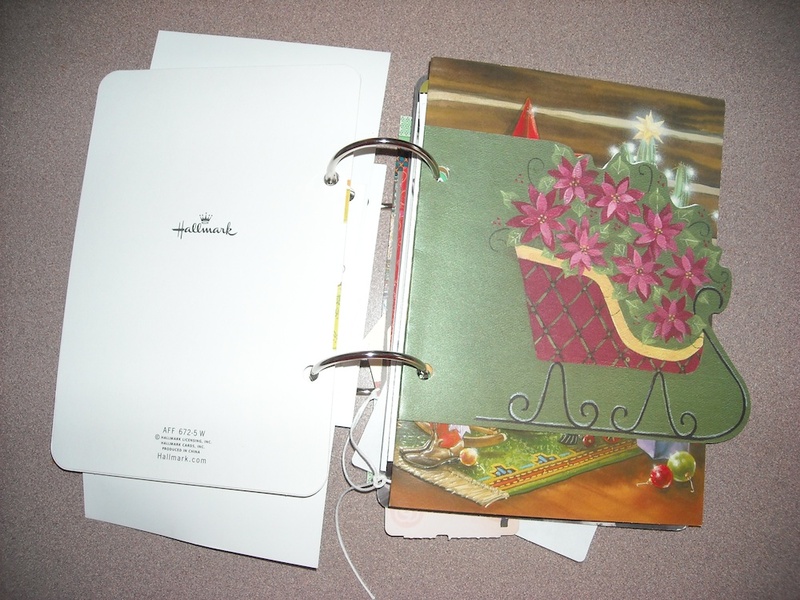 And it’s much quicker for me than trying to make a scrapbook — I’ve tried at that, and failed miserably. After working in slow motion during January, I’m back at the longarm full speed ahead this month — I desperately need to get caught up! That’s what’s been going on around here — what have you been up to? Hymmmm, the moral of this story is whining works!!!! 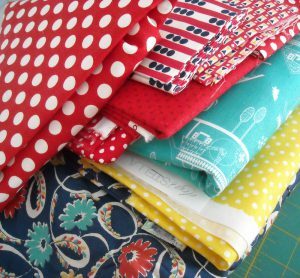 Can’t wait to see what you are making with the fabric. You need to figure out what project we are tackling this summer!!!! Love the backsplash. I had thought about doing something like that in my kitchen. Firemen’s Supper is Saturday. We plan to go early, but maybe not at 4. Let us know if you want to meet there again. 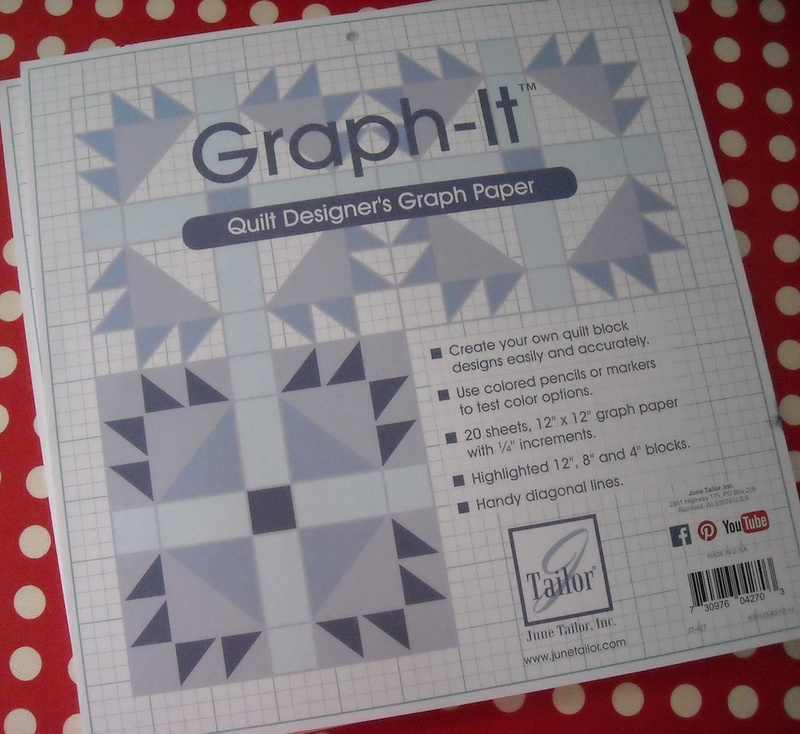 How is your quilting graph paper different than the graph paper that you can get at a regular store? 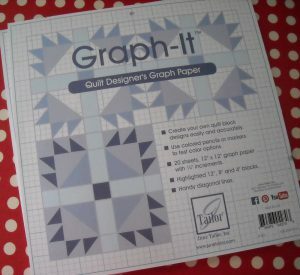 I’ve seen graph paper that is 1/4″ squares and some with smaller markers on it for much less than what I’ve seen in quilting stores, so I have wondered if it is just targeted niche marketing to quilters with a higher price tag, or if there truly is something special about the graph paper, like what you get. I am just wondering if it is worth the extra cost. It is the little things……….and sometimes you just can’t see them with human eyes. I have been trying to think of a quilt to make for Grandson Scott’s high school graduation in May. No ideas since last August and I have been looking and thinking. All of a sudden a magazine arrived in the mail last week and I was looking at it on Monday and there it was………..all I had to do was change one color and pull fabrics out and start cutting and sewing. So now I am happily stitching away on this new, but well worth it, project. 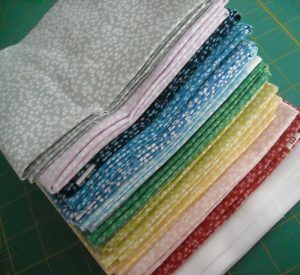 Gotta have it done spit spat (as Mary Poppins would say) so I can get a quilter for it. Love the fabric – can’t wait to see what you make. I have been working on fixing a huge mistake. I put together a king size quilt top and my blocks were not exacting right. Instead of trying to fix my mistake I put the whole quilt together thinking it would work out. It did not so now I am taking it all apart..grrr. I hate learning lessions the hard way. Hoping for a sew day I mean snow day tomorrow….hehehe..come on snow!!! I cut out and stitched up a quilt of valor I need to put on borders. I’m trying to do it for the Mota challenge. I will have to get it quilted I need to decide if I have time to try to find a long arm quilter that does the quilt of valor or if I need to just try to do it myself. I don’t know. 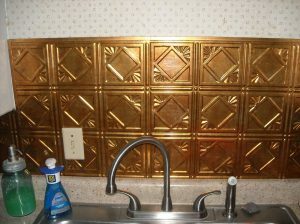 I like your backsplash and love the fabric! I know the feeling one job at a time. We have a big house project happening here. It is so amazing when you complete even the smallest job. The pride in doing your self I think. I am buried in SNOW! Help! Oh spring where are you? We have had 62 inches in 2 weeks here. YUCK! I am trying to do some Teddy Bears for the Barbara Bush Cancer Center for kids. I also am making baby shower gifts for my family who doesn’t know when to STOP having babies. So there you have my exciting life. I hate winter! That Dear Stella pile is lovely! I can’t wait to see what you make out of it!